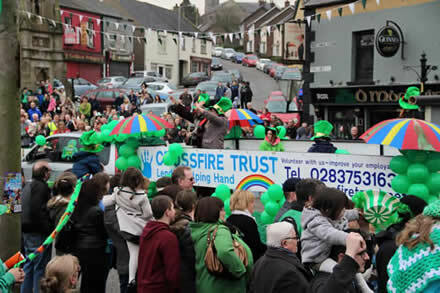 For the second year running Crossfire Trust entered a float into the St Patricks Day parade in Keady. 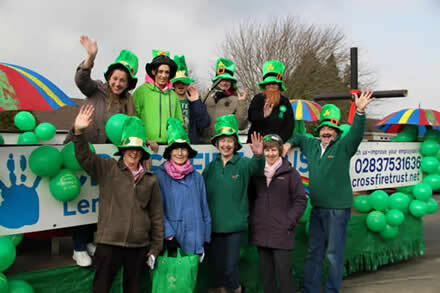 ‘The parade is a great opportunity to reach out to our local community. St Patrick is a great example of someone who overcame – personal hate and misunderstanding, cultural isolation and fear,’ said Ian Bothwell director of Crossfire Trust. ‘We are also able to let people know that we are here and what Crossfire Trust has to offer. Thank you to everyone who came and volunteered to help make our participation possible.